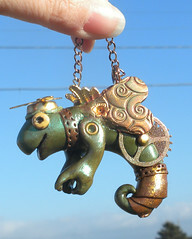 I got this very nifty book for Christmas called Steampunkery....well here is the result of my first attempt at making a steam-punk chameleon fairy lizard guy. I like it! This little guy is a birthday gift for a friend. Polymer clay, gears, glazes, and mica powder, topped with a cool propeller hat. Like the color choices and the shape of the little creature. Great work.